Nowadays VoIP telephony system is rapidly becoming the standard for business communications worldwide. Some enterprises that are migrating from traditional telephone system to the cost-saving and rich-featured VoIP environment may want to preserve their original investment like analog phones and telephone lines when enjoying the powerful VoIP features. In this case, Yeastar S-Series VoIP PBX and TA FXS VoIP Gateway will give you a favor. A well-known Chinese paper manufacturer has been expanding its company scale year by year to meet its business development needs. 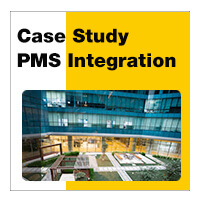 However, as the company scaled up in size, it was hard to connect the extensions from its plants to its traditional telephone system in the headquarter because of the long distance from site to site. The remote communication and cooperation between headquarter and its plants became increasingly costly and inconvenient. To solve this issue, Yeastar distributor recommended the Yeastar S-Series VoIP PBX and TA Analog VoIP Gateway solution to the paper manufacturer. 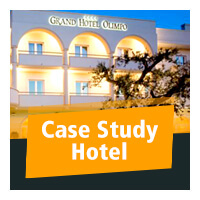 The solution was soon adopted and brought plenty of benefits to the company. As a large-scale sino-foreign equity joint venture, a well-known Chinese paper manufacturer has implemented the differentiation competitive strategy, focused on their new products and introduced new technologies to achieve new breakthroughs in recent years. In addition, it also invested a lot on building up new product lines and a new large-scale sewage treatment plant. Need to preserve the existing telephone lines, analog extensions as well as their dialing habits. Need to add 200 new internal extensions in its new workshop and the offices of the sewage treatment plant. The newly added extensions should be able to use the existing telephone lines to make and receive calls and make free internal calls with the existing analog extensions. Wangbo Internet Communication Technology Co., Ltd. is one of the most important distributors of Yeastar in China. As the local leading large-scale project contractor and system integrator in the city of Dongguan, its customers range from the government sector to the education and the financial industries. Wangbo company learned that it was unable to expand new extensions in the existing traditional telephone system of this paper manufacturer. What’s more, the newly built workshop and sewage plant were separated to the headquarter by a long distance, which made it hard to deploy the telephone lines. Therefor, they recommend Yeastar S-Series VoIP PBX and TA Analog VoIP Gateway solution to the paper manufacturer and it was soon recognized and adopted. Deploy one unit Yeastar S300 VoIP PBX in the headquarter to replace the existing traditional telephone system. 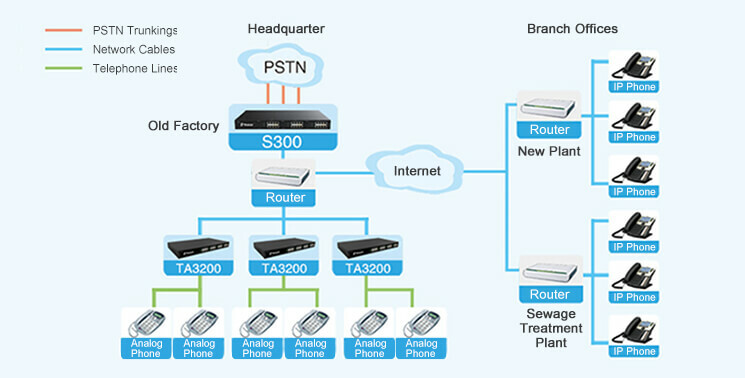 Deploy 10 units TA3200 FXS Gateways in the headquarter at the same time, connect all of them to the S300 VoIP PBX through the local area network, and finally connect all the existing analog phones to the TA3200 FXS Gateways. Deploy IP Phones in the new workshop and the sewage plant, remotely register them as the new extensions of the S300 VoIP PBX in the headquarter through the internet. No need to change the existing phone lines or add new telephone lines. Control and update the phone system with intuitive and graphical UI and point-and-click configuration with S-Series online Configuration Panel. S-Series VoIP PBX supports the auto provisioning with most of the mainstream IP Phone brands and Yeastar TA FXS Gateways. Every extension from these three sites can make free internal calls to each other directly and they all can utilize the PSTN trunks of the S300 VoIP PBX to make and receive calls. In addition, with the SIP Forking feature and the Linkus Mobile Client, you will never miss any calls from your colleagues or customers anywhere and anytime. With plenty of built-in VoIP business-enhancing system features and functions like conference, call recording, IVR, Hotel App and Billing App, S300 VoIP PBX will greatly help companies enhance communication efficiency. Preserve the existing analog phones and the telephone lines. Make full use of the enterprise network resource to build up highly efficient voice communication platform.